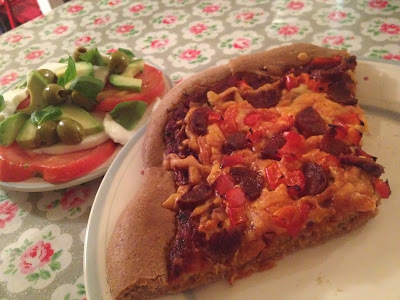 I have another recipe to share with you today - a yummy homemade pizza using spelt flour, an ingredient I hadn't used before. Spelt is a cereal grain in the wheat family, it contains less calories than wheat flour and is higher in protein. Great for anyone with a wheat intolerance. 1. Pre heat oven to 200. Mix the warm water with dried yeast and stir. Add to the other dough ingredients and mix for 15 minutes with a dough hook on your food mixer (or by hand if you don't have a mixer) until stretchy and pliable. 2. 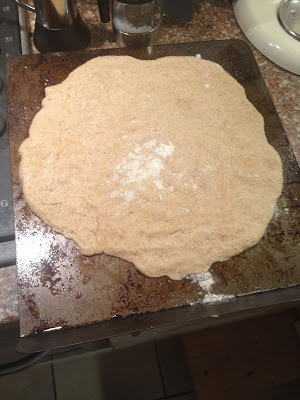 Oil a bowl, place in the dough, cover in cling film and leave to rise in a warm place for one hour. 3. 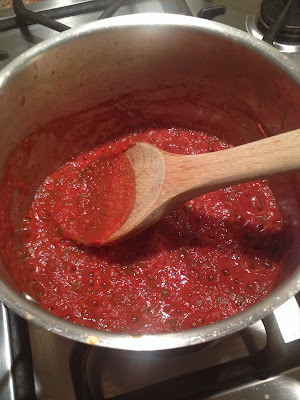 While the dough is rising add your sauce ingredients into a food processor and blitz. Place in a pan and reduce on the hob until thick and sticky, perfect for spreading on the pizza base. 4. Chop your pizza toppings ready to place on your base. 5. After the dough has risen roll it out to a 25cm size disc, place on an oiled baking sheet and cover in cling film, leave for a further 25 mins to rise. 6. Once risen cover the base in the spicy tomato sauce, leaving a 2cm crust around the edge. 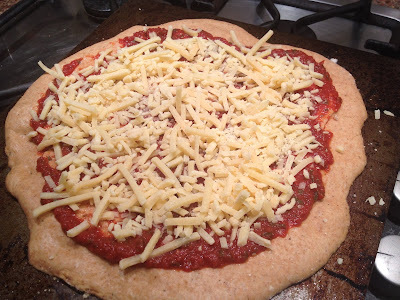 Sprinkle on grated cheese, and then add your toppings. 7. Bake for 20-25 minutes until golden. I served 1/3rd of the pizza with a scrummy tomato, avocado and mozarella salad with olives, basil and balsamic vinegar! Yum! 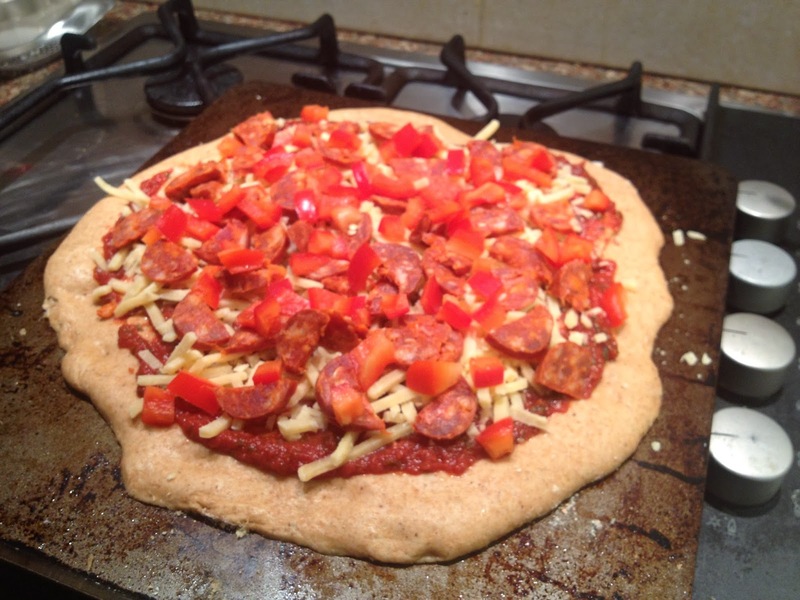 686 calories per 1/3 of the pizza - a lovely Friday night treat! The pizza tasted so scrummy; the base has a wholemeal bread taste, a nice crust and a soft doughy bottom. 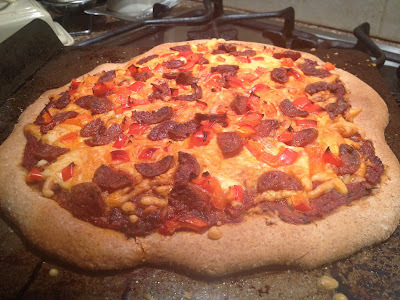 I really recommend this recipe and it would be perfect to make with kids.